Finally, time to head back to Europe. It would be another Boeing 747-8 taking me to Frankfurt, just as one had taken me from Frankfurt to Beijing the week before. It’s always truly a comfort and a spark of anticipation to see the magnificent and iconic blue-and-yellow Lufthansa livery. I truly thought (and continue to think) that this enduring brand could be relevant and distinctive forever, but year ago, they launched a redesigned brand. The redesigned brand does away with the yellow in the livery and cabins, and most combinations of blue-and-yellow across touchpoints (isolating the role of yellow to things like the “next” button when you book online). Even after a year of seeing the new branding spread onto repainted aircraft, airport gates, and online, the new brand still fills me with sadness. Seeing this beautiful cabin with the soon-to-disappear touches of yellow made me feel wistful, like seeing a good friend that you know will eventually move far away. Service started with Ritz-type crackers, and to drink I chose the jasmine tea. Then lunch was served. 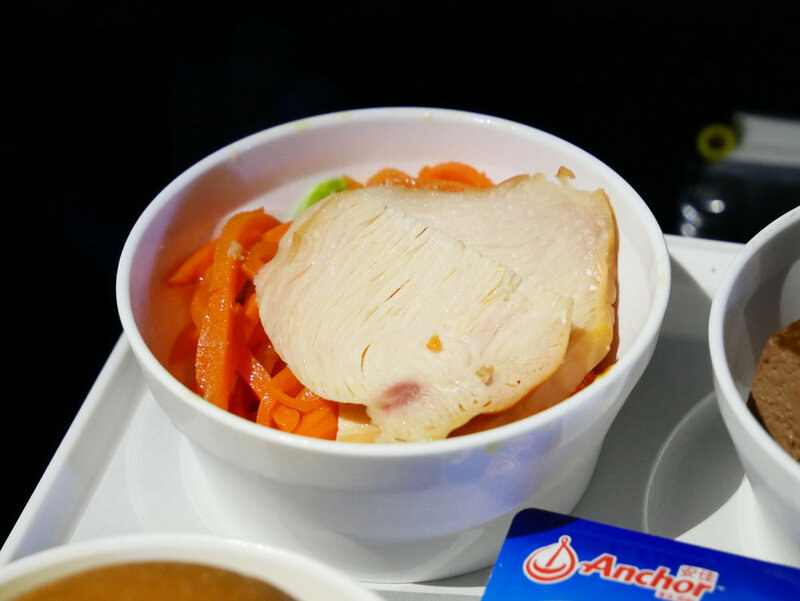 A highlight was the appetizer: a quite excellent smoked chicken breast - deeply flavorful with the smoking and juicy to boot - on a bed of marinated carrots, which was savory, crunchy, and filling. For the main course, I chose the cumin beef with egg fried rice. I figured it should be the logical choice on this flight departing China. I suppose it was alright, but perhaps a bit too saucy. Curiously, this meal was served a packet of zha cai (榨菜) or pickled mushroom stem. It didn’t seem to belong with the beef, so I ate it with the roll, like a sandwich. Besides the roll, there was also a sesame something. Just like the mashed taro in the Air China lounge, I truly couldn’t tell if this cookie was to be enjoyed as a savory biscuit or a sweet cookie! Dessert was a square of chocolate mousse. It was rather bland, and had an overly-gelatinized texture that made it feel less than decadent. 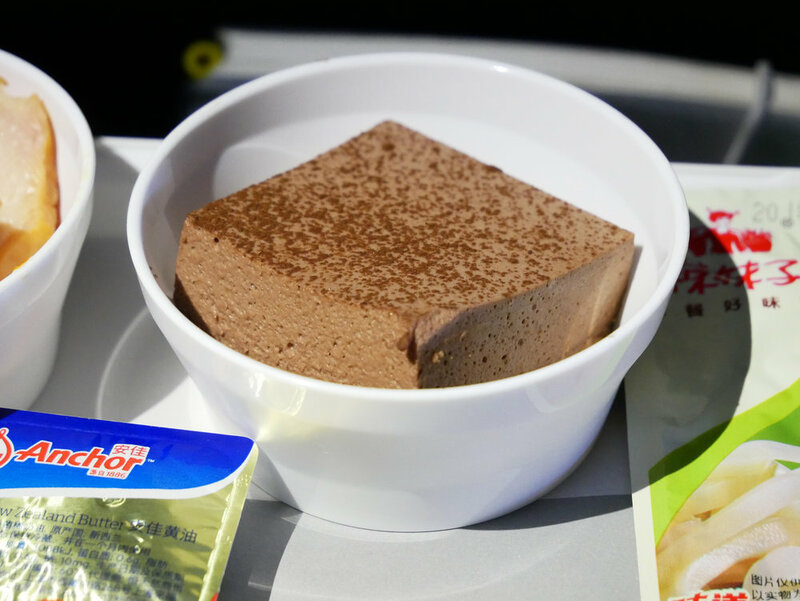 …but that is not to say that I didn’t scavenge a leftover slice of marble cake from the galley later on in the flight, after a trip to the lavatory! For the pre-arrival meal, there was a choice between pork fried noodles, and beef with penne pasta. My seat neighbor commented to me that, since we had just had the cup noodles, he was going for the beef in order to not repeat noodles (麵條). 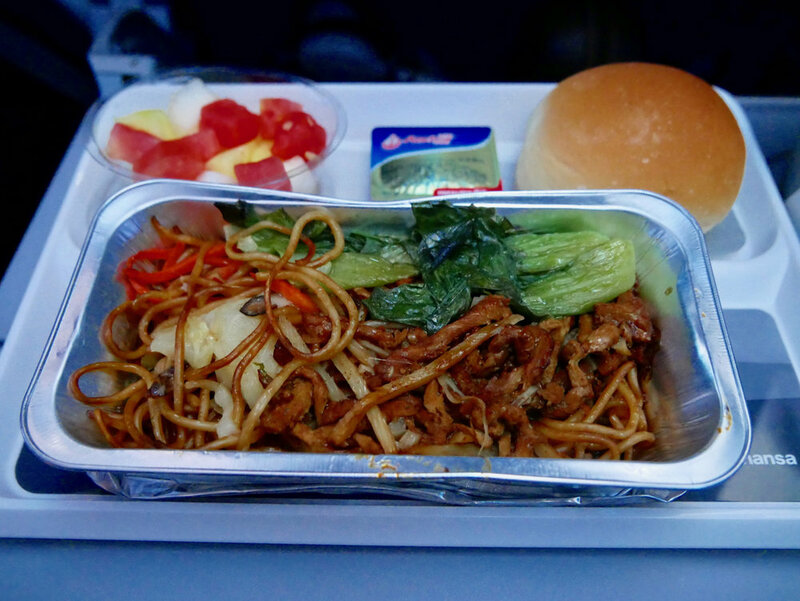 I love that for Chinese people, what distinguishes one dish with another is the starch (which is why sometimes on domestic flights the choice is rice vs. noodles)! I still went for the fried noodles. It was alright (but again the noodles were rather limp). The meal was served with watermelon, melon, and pineapple. As a note, I noticed that Lufthansa still serves the same meal in Premium Economy as Economy Class, consistent with my experience flying from Bogotá to Frankfurt in Lufthansa Premium Economy. The only difference was that the plates were on porcelain, and I also noticed that the fruit was cut into larger chunks. Overall, this was a good flight - we were well-fed, the movie selection was good, and my seat-neighbor was a friendly Chinese guy who amazingly got out of his seat only once on the 11 hour 50 minute flight. I helped him translate some things to the flight attendants who served our side of the cabin, since there were no Chinese-speakers in that group. But besides a couple Chinese flight attendants, one of the (Caucasian) German flight attendants, an older woman, also spoke Chinese!